This landmark film, made in 1961, the same year in which Israel was trying Adolf Eichmann for Mass Murder, is a stirring production concerned with the responsibility we all hold toward one another as human beings. The Chief Judge, played by Spencer Tracy, (William Shatner plays his Aide) has never been in the war, and is shocked by the devastation and destruction that he sees when he arrives in Nuremberg, which had been the seat of the Nazi Party. He is tasked with judging the defendants, all of whom were judges in Germany prior to, and throughout, the war. They were responsible for implementing the laws enacted by the Nazi Party. These laws included forced sterilization, denial of race mixing and other social programs that were all part of Germany's plans to exterminite Jews, Gyspy's and any others who did not measure up to the standards set forth by law. The War Crime Tribunal is of the opinion that these judges should have stood against these laws, even if it meant the ends of their careers, and possibly their lives. From the perspective of the Defendants this would only have resulted in other, more pro-Nazi judges being appointed, with no question as to how they would have acted in implementing these laws. 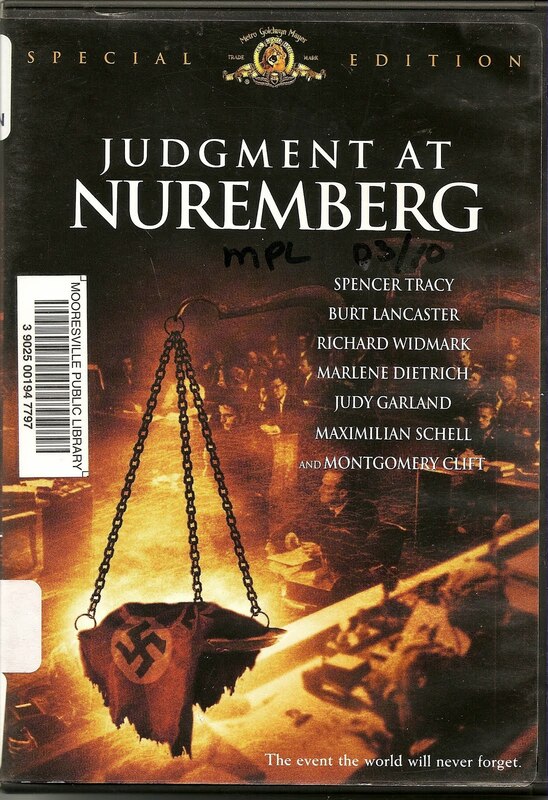 Burt Lancaster is the German judge who finally comes to realize the damage done by the collective silence of his fellow judges. Montgomery Clift is brilliant as a victim of forced sterilization. Marlene Dietrich plays the widow of a German officer who has been executed for his crimes in a previous trial. Her home is now the residence of the American judge played by Spencer Tracy. From one another they learn just what a person will do, and how far they will go, in order to protect what is theirs. Sometimes it is not an easy call to make. As Tracy struggles to understand just how the German people allowed the Holocaust to happen, he is confronted by the spectre of our own shortcomings as "victors" in the war. The German Counsel for the Defense, played by Maximilian Schell, is very adept at bringing to light our own nation's sins against our fellow man. Quoting from Justice Oliver Wendell Holmes and the American Constitution's "Seperate but Equal" clause, and invoking the horror of our own experiments with "Eugenics" in the late 1930's, usually against blacks and people with low IQ's, he brings stunning reality to bear on the questions of who is right and what is wrong. Does morality change with time and circumstance? Is there ever a real reason to commit Genocide? This film is timeless in it's subject matter. When Richard Widmark gives his impassioned speech about the brutality of the Nazi's and the futility of Appeasment, one cannot help think about the current debate concerning Islamic Fundamentalism. When does tolerance become foolish? What lengths are acceptable to employ in wiping out evil? And mostly, what are our responsibilities as individuals in standing up to the things that would destroy us all. The tension of the courtroom scenes, and the sharp direction of a tightly written script, along with superb acting and a timeless question of morality all combine to make this a "must see" film.